Looking for information on the previous Iridium 9505a sat phone? Mobile satellite communications can expand frontiers, create opportunities, and establish critical lifelines. But only when they work. The Iridium 9555 satellite phone is the ultimate in dependable mobile communications. It is a ruggedly built tool, not a toy. It won’t play games, take pictures, or play MP3s. What it will do, is work. Everywhere. 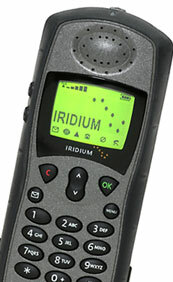 The Iridium 9555 is not only the smallest portable phone Iridium has ever made, it’s also the most powerful. With a significantly reduced footprint from the previous Iridium portable phone, more hand-friendly form factor, and aerodynamic features such as an internally stowed antenna, this sleek new handset is designed to go wherever you go. 4x16 alphanumeric, backlit keyboard, 32 digits, multiple languages, clock, removable satellite antenna, vibracall, ringing tones, IDD key, call forward, voicemail, SMS, (160 characters). Battery, AC charger with International plug kit, DC charger, Antenna Adapter, External magnetic car antenna with 5 feet of cable, leather holster, hands free earpiece and microphone, mini usb cable, CD and user manual.